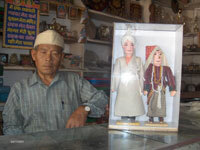 These projects have been developed in partnership with the FEMI Foundation www.femi.org and the Rung and Shaukha Bhotiyas. Our project covers the Bhotiya’s (Rung and Shaukhas) living in the trans-Himalayan valleys of Johar, Darma, Chaudas and Vyas. 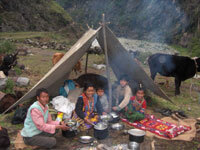 They are the legendary trans-Himalayan traders, who used to carry grain from the gangetic plain to Tibet. The Aim of the project is to work with the Bhotiyas to help revive their cultural heritage and achieve conservation through enterprise and sustainable livelihoods. 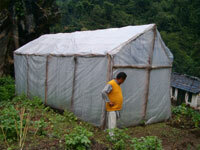 Introduction of Polyhouses to extend the growing period for Vegetables. Installing Multi purpose watermills, which provides mechanical power for flour and oil milling and also 5 KW of electricity to the villages unconnected by the electricity grid. Documenting and encouraging the conservation of local varieties of crops. Supporting children to get education. Renovated and restored two old houses in Vyas Valley for Community based tourism. Fifty Bhotiya farmers have been provided training in installing and growing vegetables in low cost poly houses. Poly houses an Poly tunnels insatalled at three villages in Vyas and two villages in Chaudas. Installed the first water Mill (microturbine) to generate 5KW electricity at Burfu village in August 2006. 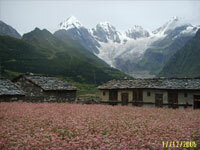 The Village is 60 km from the road head and at an altitude of 3500 m, close to the indo-tibetan border. Documented the Agrobiodiversity in their valleys which helped them win the award Protection of Plant varieties and Farmers Rights Award for protecting “Naphal” a wheat variety. 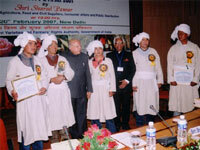 Citation from the "Protection of Varities and Farmers Rights Authority, New Delhi"